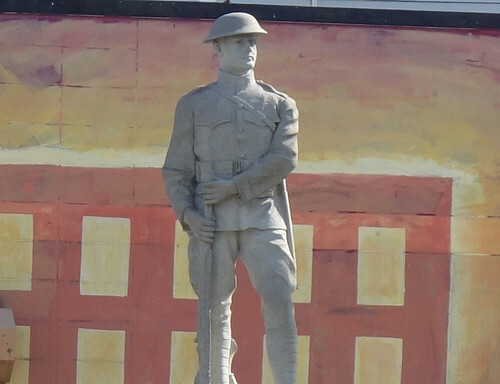 The “Lowell Doughboy” statue, located at the intersection of Fletcher and Willie streets, memorializes 36 men from Lowell’s Acre neighborhood who were killed or who died while serving in the US military during World War I. The statue was erected and dedicated in 1923 and has remained in the same place ever since. Now, the Lowell Firefighters Club, which now occupies the building at that corner, wishes to move the statue from its home of 95 years to the North Common to make way for a 9/11 memorial to first-responders. Earlier this month, Barry Connolly, the descendent of John Leo Connolly, one of the deceased soldiers memorialized by the statute, wrote a letter to the editor of the Lowell Sun stating his opposition to moving the statue. The Sun followed the letter with a news story about Connolly’s opposition. At the November 13, 2018 board meeting of the Lowell Historical Society, it was voted to express our opposition to moving the Doughboy statue from its present location on Fletcher Street to the North Common. This statue was dedicated on June 3, 1923, by the proud residents of the Acre neighborhood and thousands of Lowell residents attended its unveiling. The statue itself honors the 36 men from the Acre who gave their lives during World War One. We implore you to leave this monument right where it has been for almost a hundred years. It is part of the neighborhood. Having growen up in the Acre and also having served in our armed forces in time of war, I beg those in charge not to move this symbol of sacrifice and honor. We can continue to focus our attention on these symbols of our past with out removing others. The American soldiers of World War One held their ground in France and Paying a heavy price to do so And with this in mind, let all people in the Lowell area still pay their respect and admiration at this commemorative statue of brave Lowell Doughboy’s where it has been for nearly a hundred years. We all in America have a deep appreciation and respect of all first-responders of 9-11 and a suitable memorial should be erected to those who sacrificed their lives: However,not at the cost of those brave heroes who served before them. I couldn’t agree more with the Lowell Historical Society’s position on the Acre Doughboy memorial. We have a duty to preserve Lowell’s history for future generations. Of course a 9/11 memorial is a good idea. I am sure an appropriate location other than the ground the Doughboy stands on can be found. The Lowell Firefighters Club should think creatively and with an open mind.